Raymond Steffen in the 1922 Ford, Lucille Steffen sitting on the fender. Aberdeen Store in 1925. Note the new glass bowl gas pump and electric light over the door. Sign left of door reads "Delaware Punch." Aberdeen School class of 1918 when Irene Steffen graduated. Top row (L to R): Anderson, Claude Howard, Francis Giraud, Irene Steffen, Elsie Howard, John Jones, Paul Zucco. Bottom row (L to R): Rollin Williams, Stanley Steffen, Raymond Steffen, Hill, Tibbits, Muldoon. Children from the east side of the river were Goldie Cowsart, who later married Dallas Jones, John Jones, Stanley and Raymond Steffen, Allie Swingrover, Olive Jones, George (last name unknown), Allen and Ray Ball. Photographs by Mrs. Peter (Annie) Steffen, author's mother. 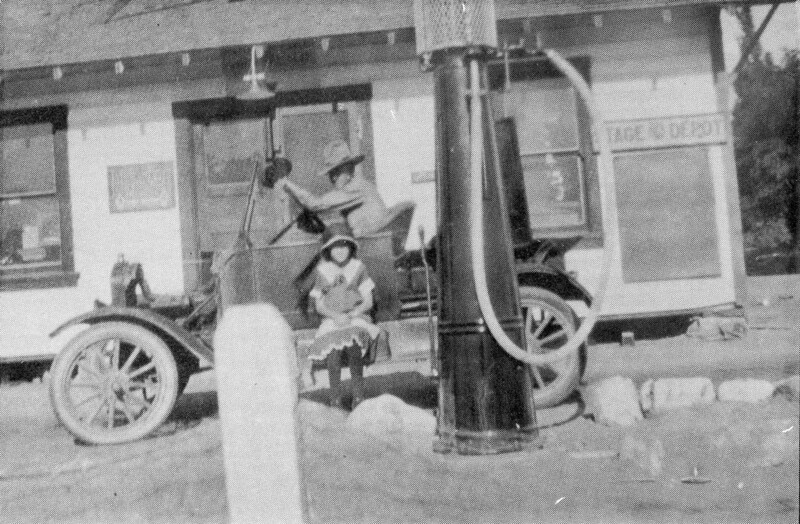 Aberdeen Store in 1923, Irene and Waunita Steffen at left. At 17, Irene was the youngest postmistress in the U.S. First to pump gas - to pump gas you turned stops for 1 quarter, 1 gallon, or 5 gallons, then turned handle to stops. Sign over the door.- Aberdeen California Post Office; right of door.- (soft drinks called) Whistle; right of window.- Stage Depot. The stage was an 8-passenger Packard cloth-top. 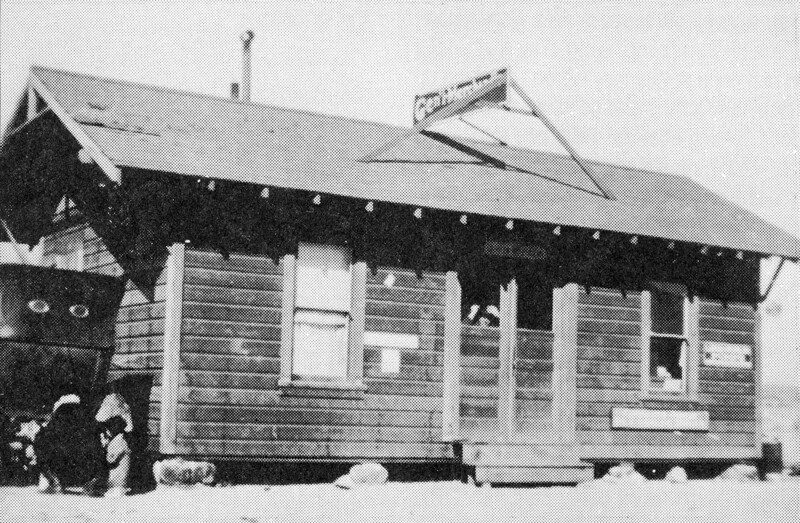 Aberdeen Store, 30' x 20', built in 1921. It withstood the wind in 1922 on just a rock foundation. Dad served Red Crown gas in quart and gallon measured cans. It was delivered in 50 gallon drums; kerosene, called Pearl Oil Very Clean Kerosene came in 50 gallon drums, motor oil in 18 gallon drums, and disolatate (later diesel fuel) in 50 gallon drums, all purchased from Standard Oil Company of California. 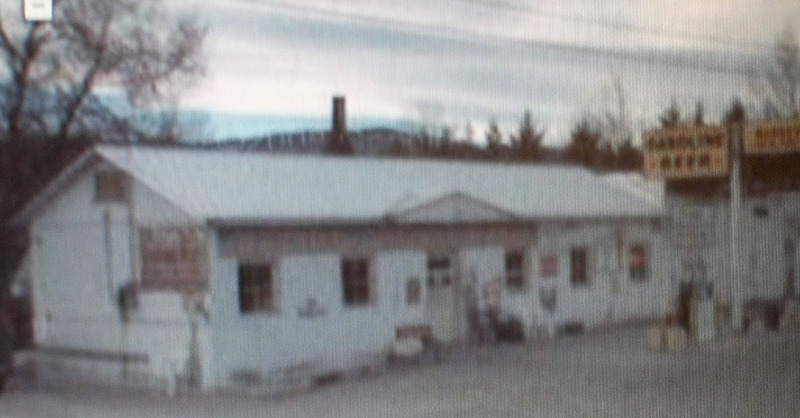 Sign on top of store: General Merchandise; left of door: - Gates Tires. 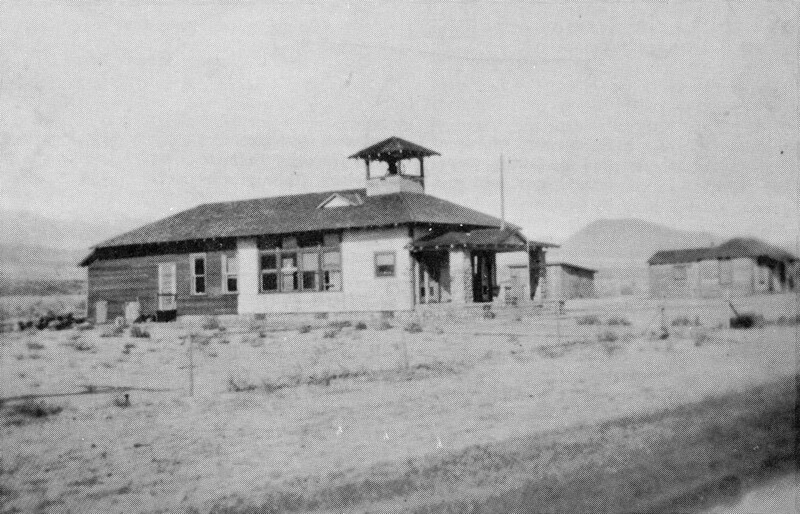 Aberdeen School in 1923, with the addition after the wind damage - Note the fence built because of heavier traffic after the concrete road was laid. The addition in the rear was built after the wind damage of 1922. To the right was teachers (Mrs. Nail) house. After Mrs. Nichols (who married a Mr. Bower), Mrs. White and Mrs. Henderson were teachers there. In warm weather, we went to Gooddale Creek for a bucket of water and everyone drank from one dipper. 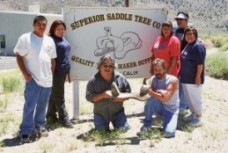 Mrs. Nail's husband Ernie was foreman on the Orbin Ranch just north of the store; the owner was from Southern, California. The ranch had 40 acres of alfalfa and 20 acres of orchard. My favorite place in the world is Convict Lake, where we have "camped" since 1954, at age 8 and have returned dozens of times. I climbed,alone, the 'spur' of Morrison Peak, at age 11. 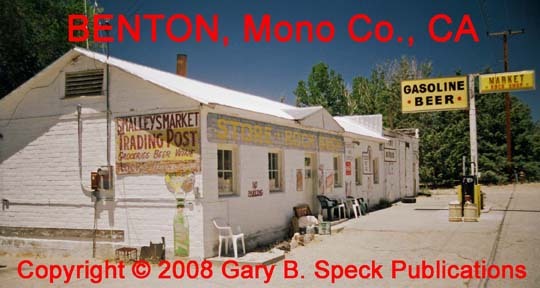 As it turned out, I was adopted upon birth, but my 'biological' mother, I learned, lived in Bishop and she and her husband ran the general store in Benton from 1947 into the 1960s. Though I didn't know about this until 2007, I have always been drawn to Owens Valley, I thought just for its beauty. Now at age 68+, when the time comes, scatter my ashes at Convict, or close by. Here is a photo of me at the Pioneer Cemetery in Bishop. It was the name Raymond Steffen that interested me. 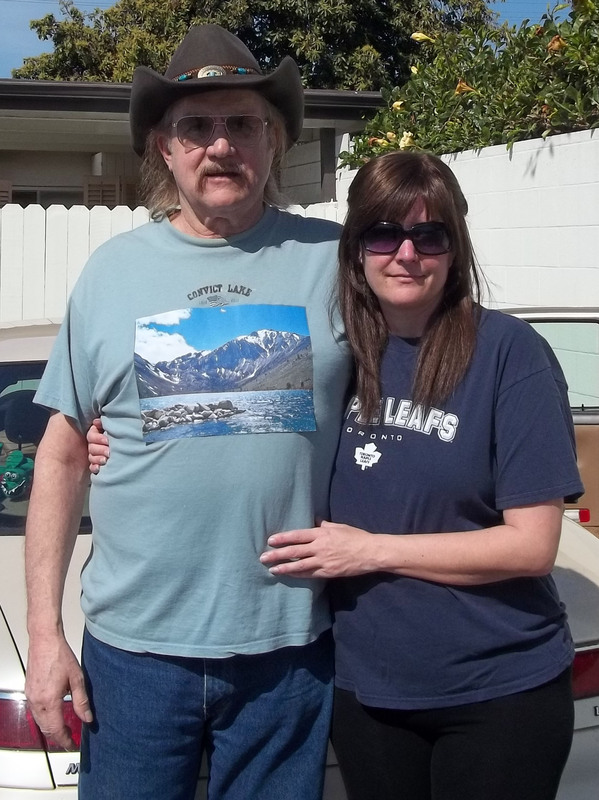 You see, he married my "biological" mother on April 27, 1946, one month after I was born. I was born to Mary Arlene Davis, on March 23rd as she became Ray's girlfriend during her pregnancy. 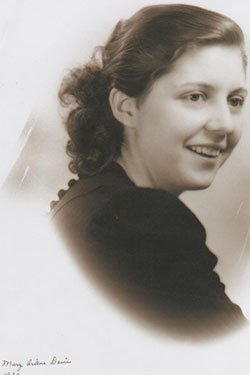 She was impregnated by Charles Nunley, as the three worked together at Lockheed (she as a "Rosy the Riveter", supervisor, and the two men as machinists), in Burbank, during WWII. I was conceived between VE and VJ Days, as it must have been a "hell of a party." 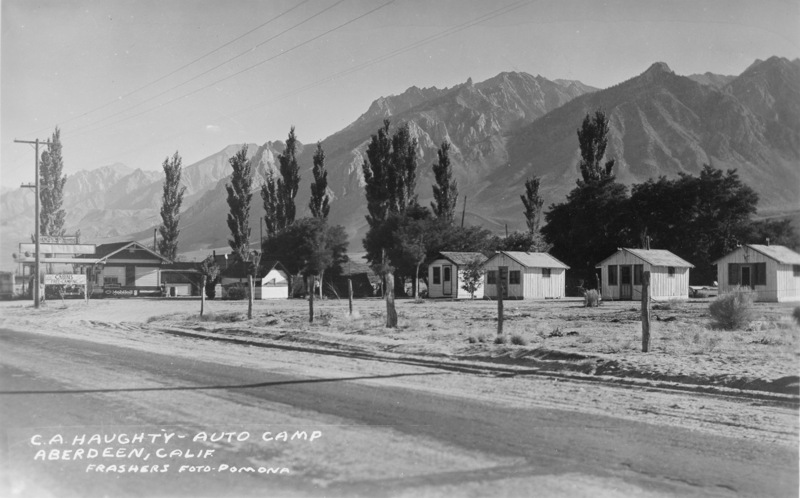 After I was born, Ray and Mary Arlene moved back to Owens Valley, near where Ray had grown up in Aberdeen, and lived in Bishop and Benton for the next 61 years, until they died, six months apart. They are buried in the Pioneer Cemetery in Bishop. 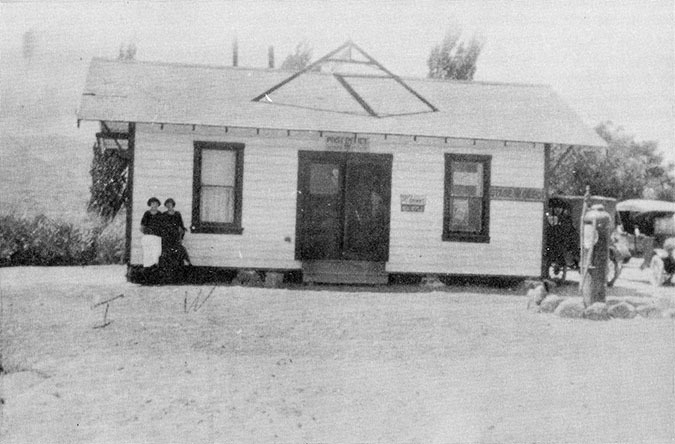 Here are a few photos that might be of interest to you, as the couple built and ran the concrete block store in Benton Station in Chalfant Valley. 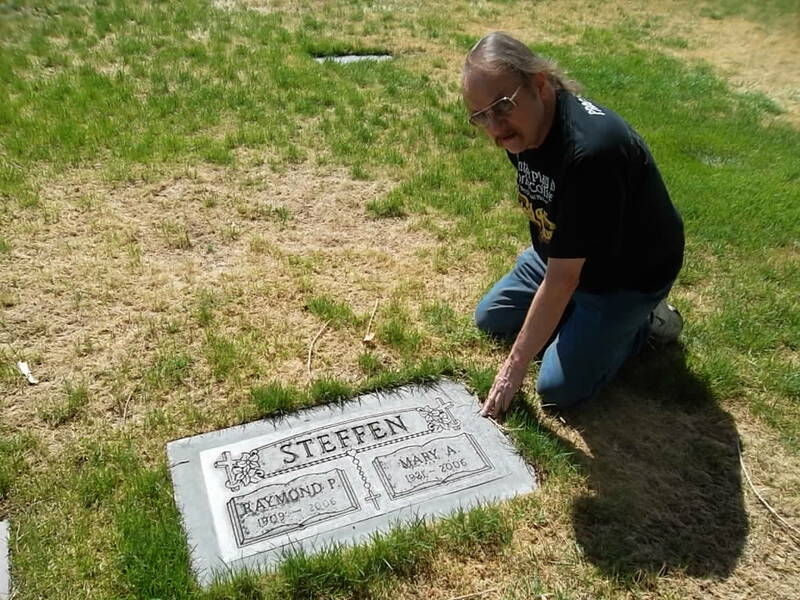 Raymond Paul Steffen had previously been married to Lorene and had a daughter, Mae Marie Steffen, who was born in 1931 in "the Valley." 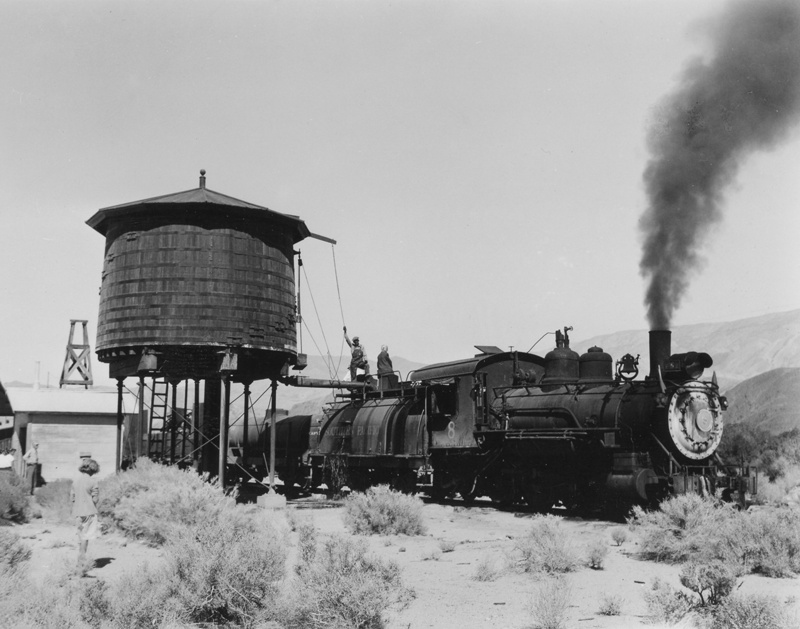 Before Ray moved to Burbank, he worked as a "Gandy Dancer" and fireman, initially for the Carson & Colorado narrow gauge railroad (which later became the Southern Pacific) until the line closed down in 1936. 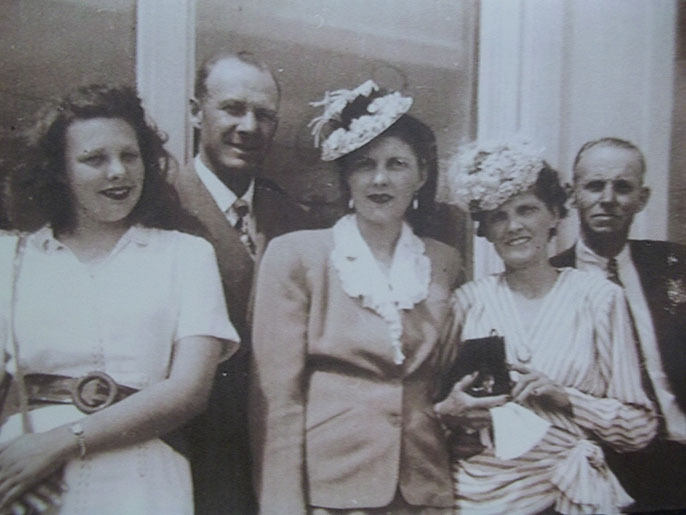 Ray's father was Peter Frank Steffen Sr. (born in France) and mother was Elizabeth "Annie A" Agnes Oper (also from France). 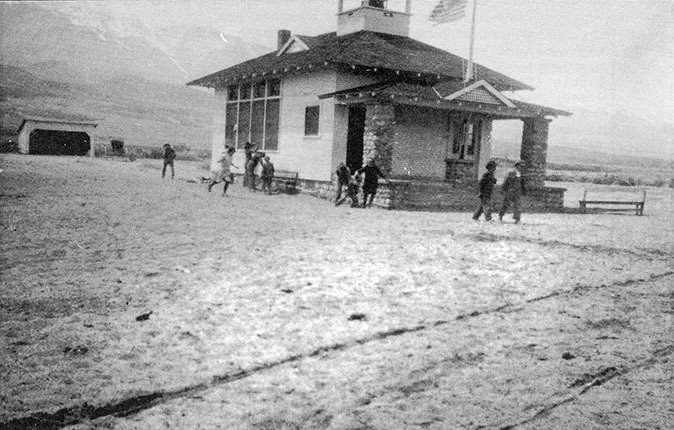 Ray's older brothers were: Peter Jr. (who, with his wife Waunita, lived in Benton) and Stanley, who ran a pack outfit through Taboose Pass. His sisters were: Cecilia (who married Ike Williams who helped build the Inyo Courthouse), Irene and Lucille. 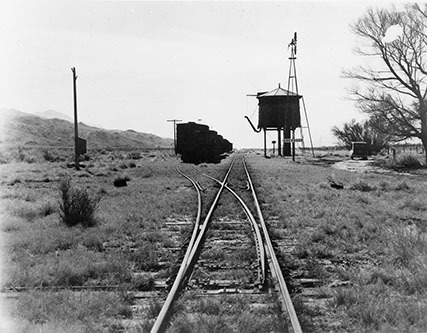 They moved from St. Paul, Minnesota to Los Angeles where Ray was born in 1909, then "homesteaded" the Aberdeen Station, before ray was born, around 1910 or 1911. 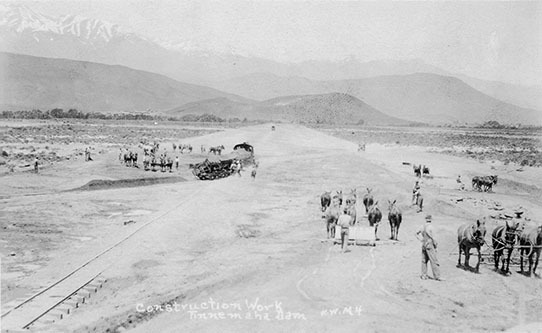 As I said previosly, Mary Arlen Steffen, after leaving the Benton Store, that Ray built, which is now called "Smalley's," she worked as a secretary for the California Interstate Telephone Company. 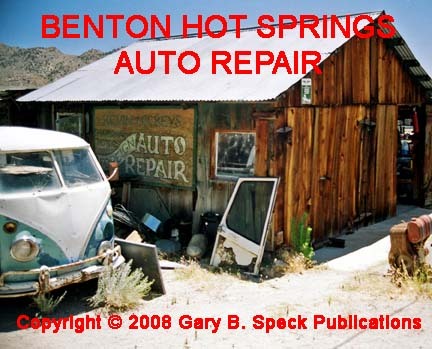 While in Benton, Ray used this "barn" as his auto repair garage until he built an additional concrete block building across from the Benton Station Cafe. 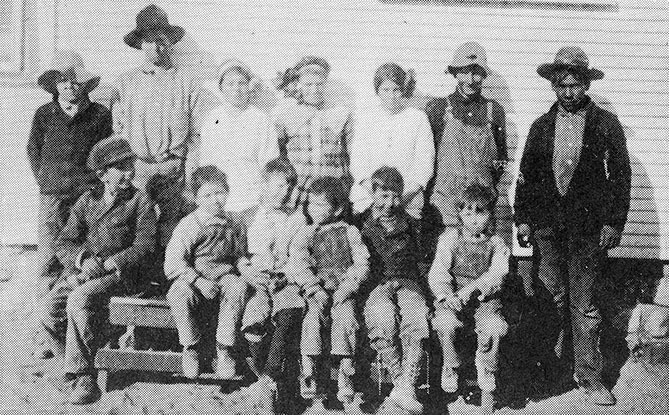 While at Benton, they were friends with, who would later be the Benton Utu Utu Awaitu Paiute Chairman, Bille "Jake" Saulque. I met him in 2013. He's in the center. 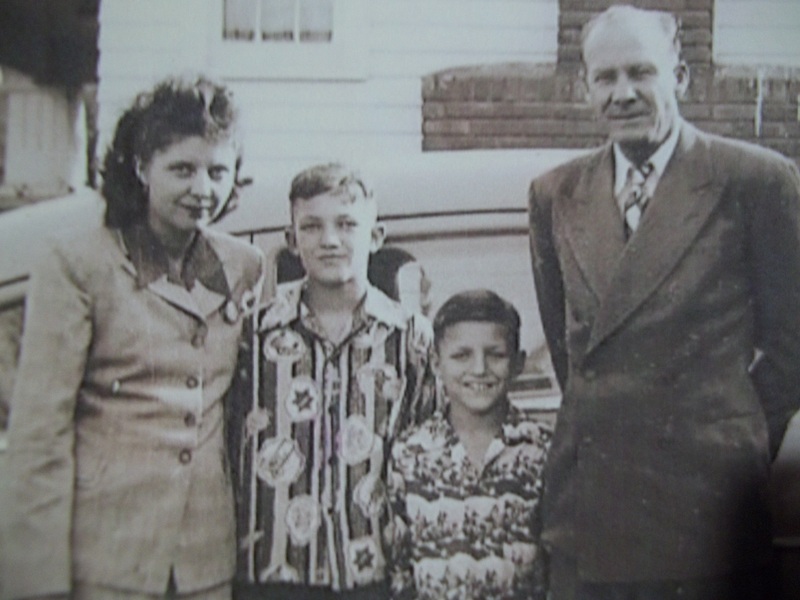 This picture is of Ray Steffen, Mary Arlene and her nephews, Dock and Tommy Kerbow, who lived with them in 1948. Dock has recently been very helpful in my piecing together of my mother's early days in Inyo and Mono Counties. (L to R): Unidentified, Ray Steffen, Mary Arlen Steffen, Mary's mother Idris, Axel (Idris' 2nd husband). Photo taken at the Calvary Baptist Church in Bishop. 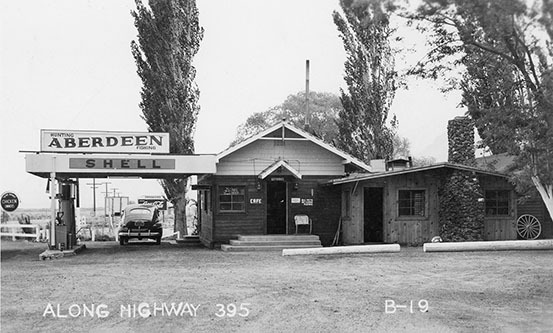 Aberdeen, CA when U.S. 395 still went by its front door.